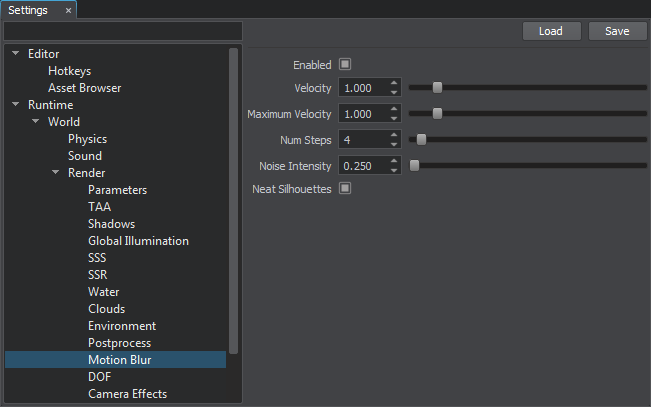 This section contains settings for the motion blur effect. Toggles motion blur on and off. Amount of motion blur for moving physical bodies. The higher the value, the more blurred the objects will appear when moving. To avoid excessive blurring of fast moving objects. To save performance, as increasing the object's velocity leads increasing the radius of the motion blur effect that drops performance at too high values. Sets the number of steps used in the motion blur. The higher the value, the more correct the motion blur effect is. At low values, moving objects may look doubled, however, performance will increase. Intensity of the noise used in the motion blur. Enables the neat silhouettes for motion blur. When enabled, this option keeps contours of objects in front of the camera unblurred.